Advertising your gluten free business, product or service on Vivaglutenfree.com is as easy as 1-2-3! With the Gluten Free world EXPLODING with growth, NOW is the time to advertise your "Anything Gluten Free". As you may have already noticed, my site is created to cater to the everyday Gluten Free Guy or Gal who is working to live their life Passionately, Positively and Proactively. They are in need of High Quality help. That help could come from YOU! By advertising on my ever rapidly growing site, you will have the opportunity to ride the wave of success and be a source of support by providing YOUR business, service or product to purchase. Your target market will come to you! Exposure to my site is growing exceedingly every day and is expected to triple in growth in the next 6 months alone! Why not be along for that successful ride? Take advantage of my Free Newsletter that allows you to keep current with new recipes, Food for thought, and encouragement to keep you on your path, especially written for my subscribers! I promise to use it only to send you Our Glorious Gluten Free Life. I do make a small commission on each purchase of any product on this site. Your support is very appreciated! These books make it on my list because I Respect their Logic! 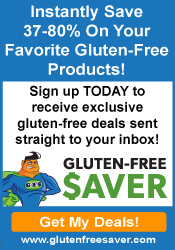 Gluten Free Saver -It's like Groupon for Gluten Free-ers! 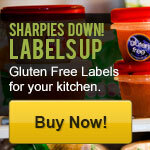 Check out this really great Directory to help you find your Gluten Free Anything! Please note that I am not a dietitian, Dr. or other medical professional so this website should be used solely for informational purposes and not to gain a medical diagnosis. All Rights Reserved.